We've Just Released Weird Hollywood! Known as the “Movie Capital of the World,” Hollywood is chock-full of offbeat characters, peculiar activities, and strange sightings. 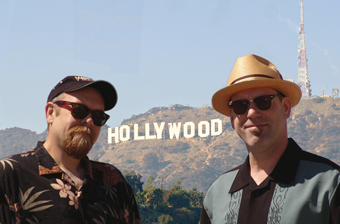 With California resident and humorist Joe Oesterle as your guide, meander through bizarre back alleys and darkened theaters, observe the kitschy Singing Chairs of Santa Monica (a pair of 15-foot-tall harmonizing thrones), and take a walk down the haunted Boulevard of Broken Dreams. Weird Hollywood also offers readers a hellaciously fun, historical journey into Tinseltown suicide, murder, and mayhem. And who better to preface the tour of this wacky municipality than the Voice of Hollywood himself: Gary Owens.